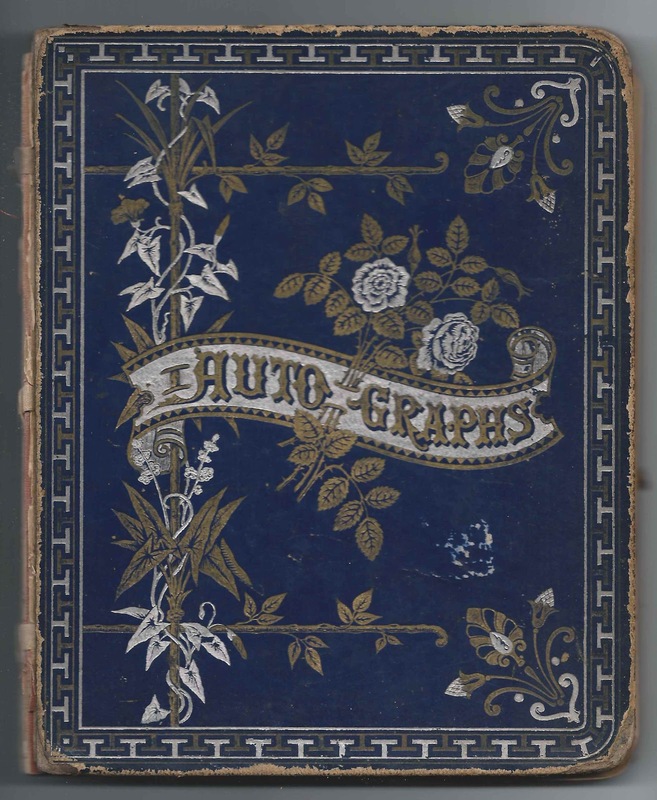 Album presented to Nettie May Fisher in 1879 by her sister Nellie. Nettie was also known as Jeannette G. M. Fisher. 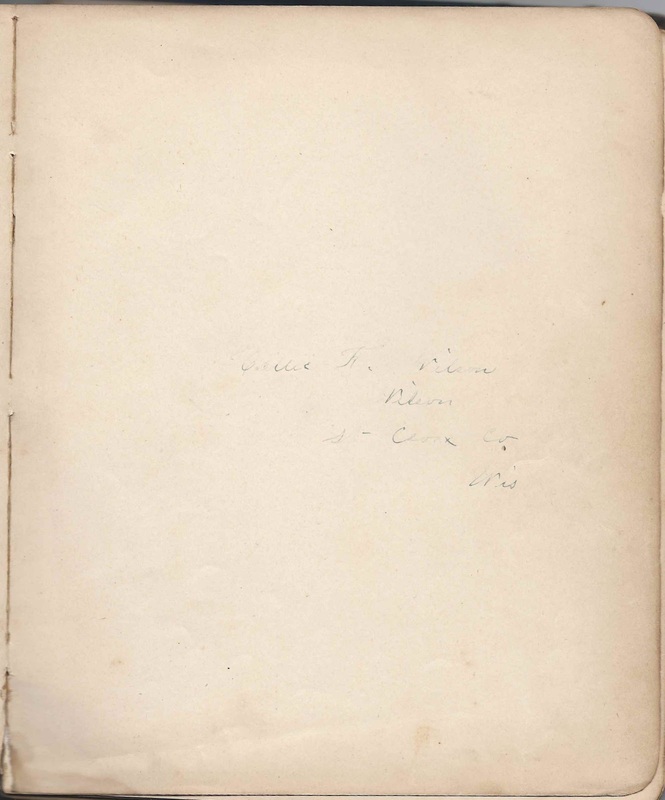 Nettie wrote her name on several of the beginning pages. I'm not sure if sister Nellie was a full sister or a half sister or a stepsister. 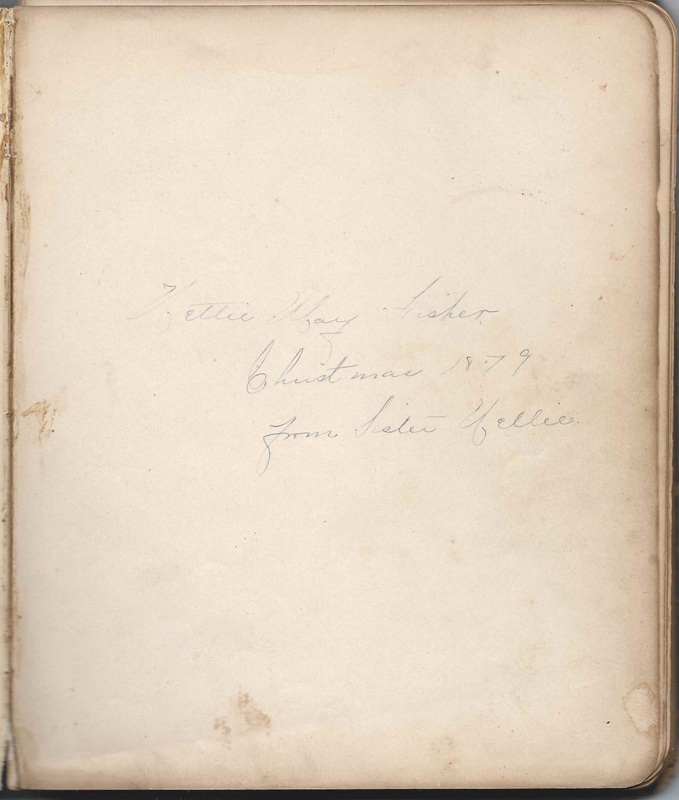 In addition to the presentation page, Nellie signed another page in the album. The album is approximately 8-1/2" x 7" and contains the sentiments of about 110 of Nettie's relatives, friends and schoolmates. An alphabetical list of the signers appears at the end of this post. 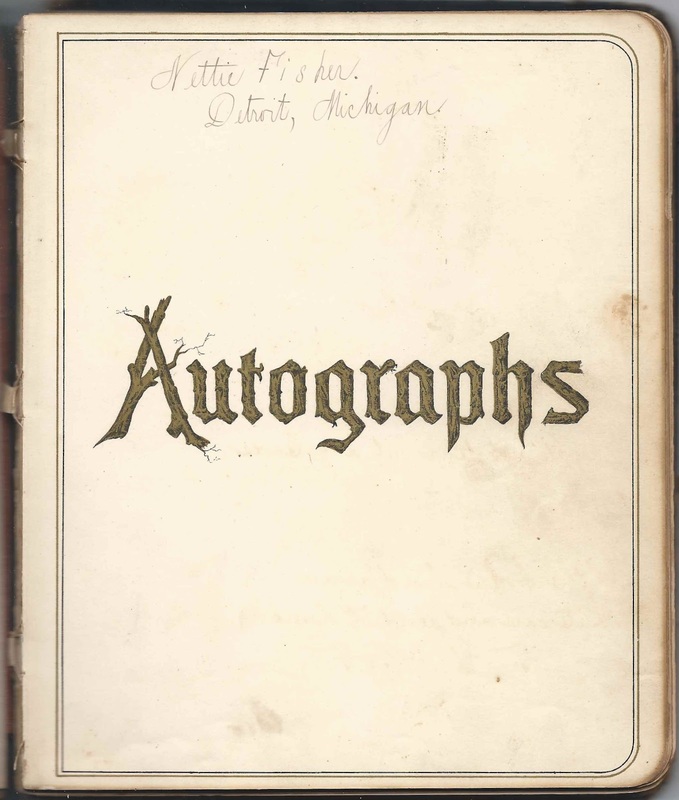 Many of the pages were signed by Nettie's schoolmates at Detroit High School at Detroit, Michigan. Many other pages were signed at Pine Orchard, Connecticut; whether the Fisher or Smalley or Case families had relatives there or if it was a retreat, I don't know. According to her birth record, Nettie G. M. Fisher was born 26 September 1871 at Detroit, Michigan, the daughter of Elam G. and Mary C. Fisher. Other records show Mary's maiden name as Smalley. 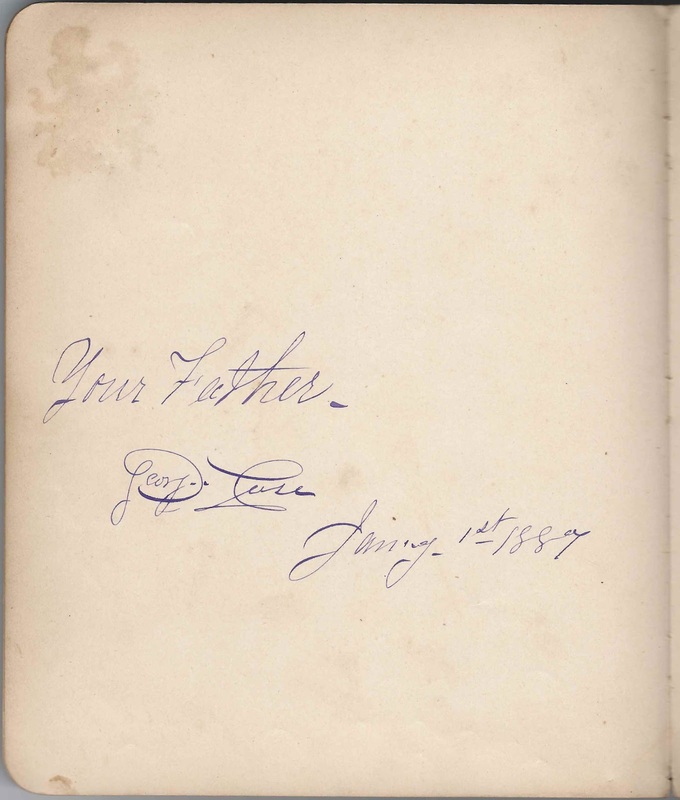 Nettie's mother signed a page in her album, but by then she was married to George Case, who signed the left facing page. 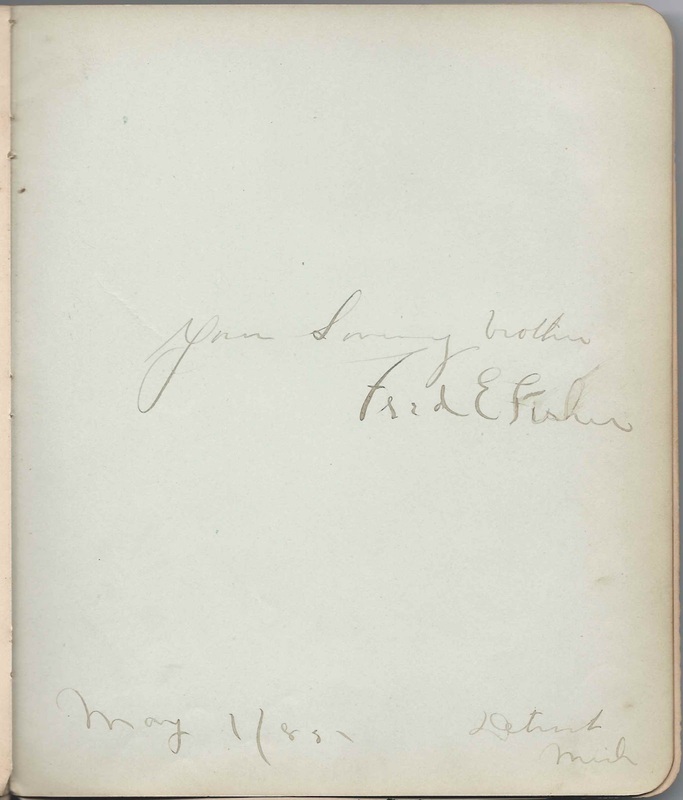 Nettie's brother Fred E. Fisher signed a page at Detroit, Michigan, on May 1, 1885. 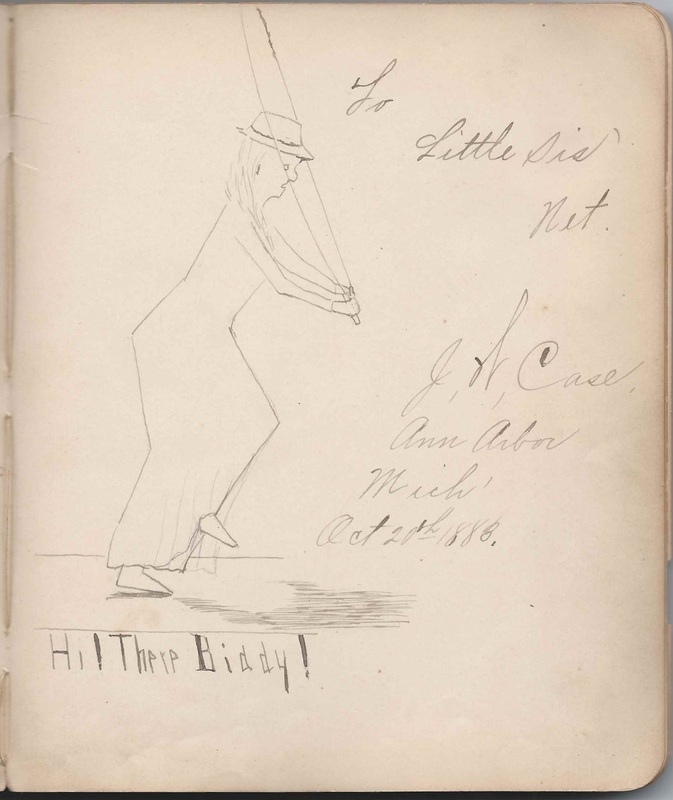 J. W. Case of Ann Arbor, Michigan, signed a page on October 20, 1883, and called Nettie his "Little Sis". He was apparently the son of George Case from a previous marriage. On 22 November 1899, Nettie married Edwin Bannister Forbes, son of William and Irene Forbes. Edwin was born 20 May 1874 at Lowell, Massachusetts, graduated from Phillips Andover and Harvard University and Medical School and set up a practice at Detroit, Michigan. The couple had a son and a daughter, Ethel Irene Forbes and Edwin Fisher Forbes. If you have corrections, clarifications or additions to the information above, or information on any of the signers listed below, please leave a comment or contact me directly. Thanks! Mary S. ?, signed at Pine Orchard, Connecticut, in 1887. Surname begins with M.
Annie Rosalie Baldwin of New York, signed at Pine Orchard, Connecticut, on August 17, 1887. She was Vice-Pres. of P.T.C. 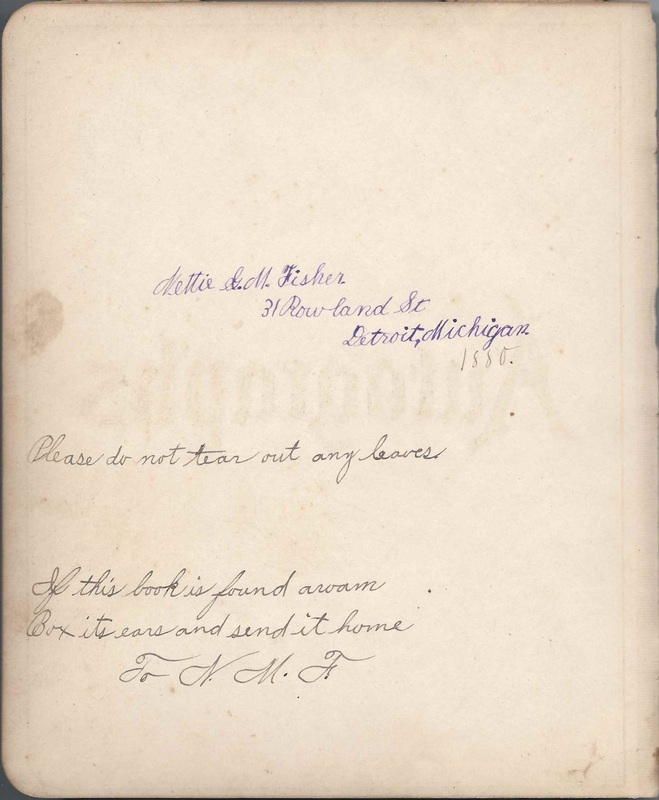 Steve J. Davis of Ypsilanti, Michigan, signed on June 8, 1885; "Bull-dog, bow-wow-wow"
Alice C. Day, signed at St. Louis, [no state given], on August 2, 1887. She may have been a resident of St. Louis, and was vacationing or at a retreat at Pine Orchard Connecticut; P. I. C., or P. T. C.
Nettie G. M. Fisher, 31 Rowland Street, Detroit, Michigan, 1880. "Please do not tear out any leaves." "If this book is found aroam, Box its ears and send it home. 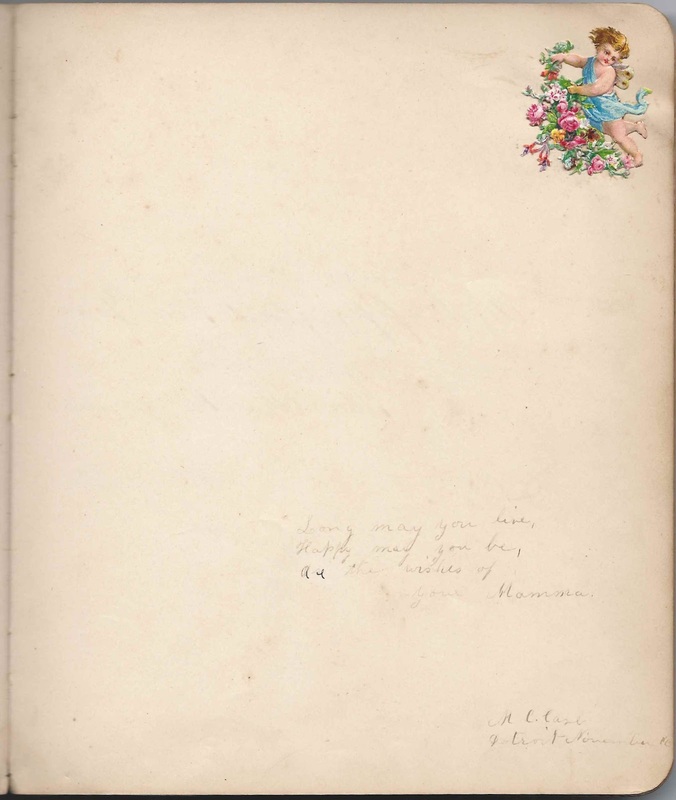 To N. M. F." The album was given to Nettie at Christmas in 1879 by her sister Nellie. 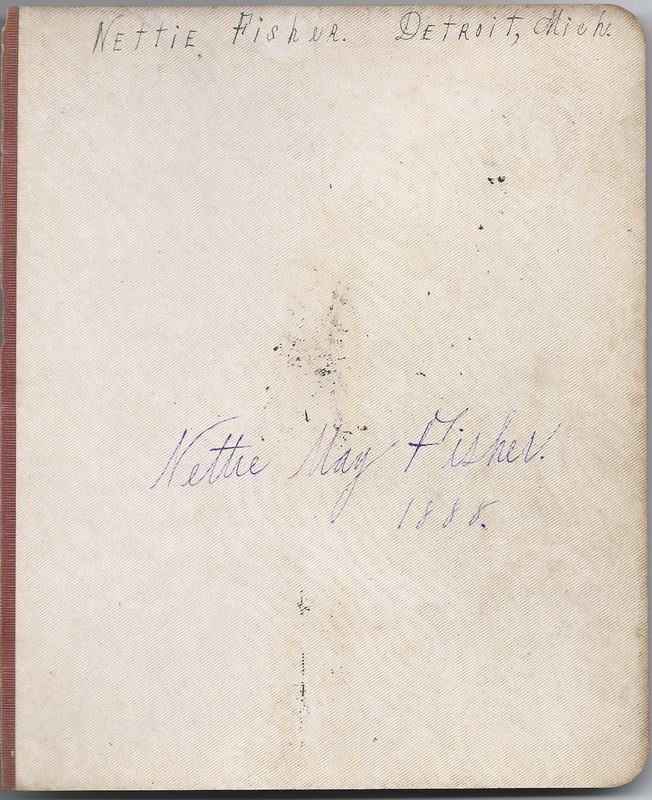 Fred E. Fisher, signed at Detroit, Michigan, on May 1, 1885 [not sure of last digit]; Nettie's "Loving brother"
Name is very hard to read; possibly John A. West or Jonathan A. West, but not sure of surname. Charles P. Wetherbee, signed on January 1, 1887; Nettie's "Friend and Caller"